Egyptian President Abdel-Fattah El-Sisi issued a decree on Wednesday giving him the authority to transfer non-Egyptian defendants on trial or already convicted to be sent to their countries to be tried or serve their sentences. The new law stipulates that the general prosecution has to request the transfer of the prisoners and the cabinet has to approve the request. ’This law was issued to uphold the interest of the state and to maintain the international image of Egypt," Presidency Spokesman Alaa Yousef said in a presser on Wednesday. Yousef also said the new law is in line with the adequate legal framework Egypt is establishing, adding that, by serving their sentences in their countries, defendants will find it easier to reintegrate back into society after their release. 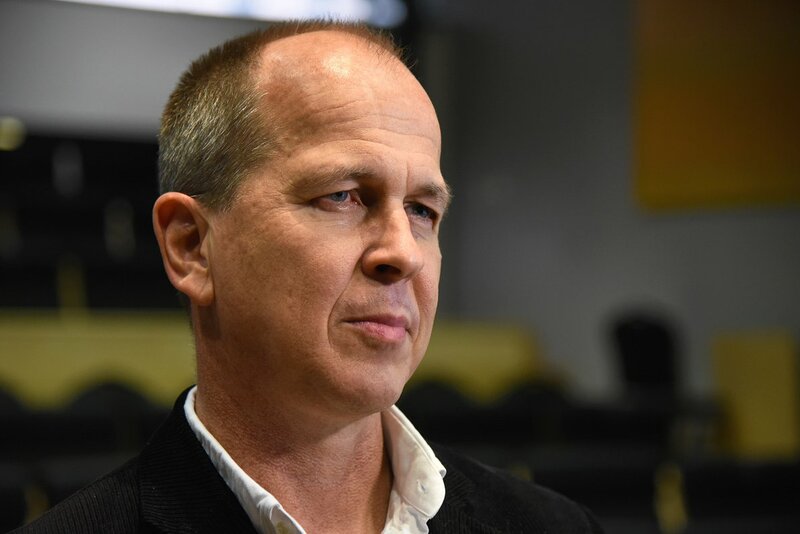 The law might be utilised in the highly publicised case of AlJazeera journalists as two of the three detained defendants, Australian Peter Greste and Egyptian-Canadian Mohamed Fahmy, are foreigners. It is still unclear whether the new law will apply to detained Egyptians with dual nationalities. The three were sentenced in June to jail terms ranging from seven to ten years for spreading false news and aiding the Muslim Brotherhood. Another publicised case where the new verdict can be applied is the case of Egyptian-American Mohamed Soltan, who has been on hunger strike for over 285 days and is being tried in the case known as the “Rabaa control room”. Soltan, 26, along with 50 others, is accused of setting up an operations room during the Brotherhood-led Rabaa Al-Adaweya protest camp in July – August 2013, as part of plans to defy the state and spread chaos, as well as plot attacks on police stations, private property and churches. Today Al Jazeera marks 300 days since the arrest of its journalists in Egypt. The broadcaster will mark the occasion with 300 seconds of silence on-air, accompanied by images of the detainees and the campaign to release them. But there is hope on the horizon as the Egyptian government has announced that a court will consider an appeal against their convictions on 1 January 2015. Al Jazeera says the process was flawed and is using this as a basis for the appeal so the hearing will look at the process behind the original trial. 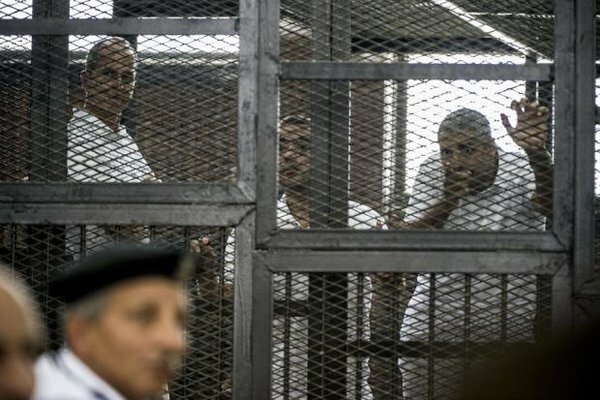 The network hopes the three - Baher Mohammed, Mohammed Fahmy and Peter Greste - will be set free, though a retrial could also be ordered. Baher Mohammed, Mohammed Fahmy and Peter Greste were sentenced to between seven and 10 years in June, after being arrested in December last year. Since the appeal was filed, another Al Jazeera journalist in a separate case, Ahmed Mansour, was convicted in absentia to fifteen years in jail. 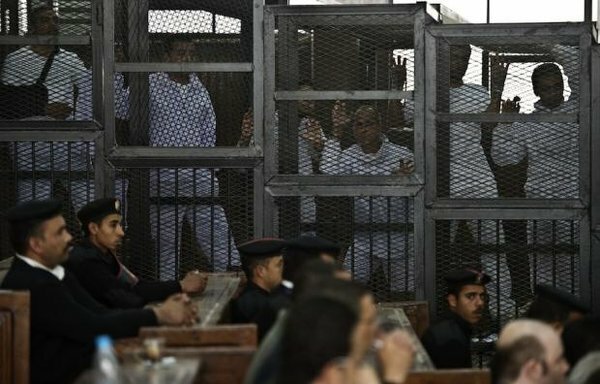 Un tribunal égyptien a condamné aujourd’hui à sept ans de prison trois journalistes de la chaîne qatarie Al-Jazeera, accusés de soutenir les Frères musulmans du président destitué Mohamed Morsi. Le journaliste égypto-canadien Mohamed Fadel Fahmy, chef du bureau d’Al-Jazeera avant que la chaîne ne soit interdite en Egypte, son confrère australien Peter Greste et l’Egyptien Baher Mohamed étaient détenus depuis près de 160 jours. Dans cette affaire, qui a provoqué un tollé international, neuf autres accusés dont deux journalistes étrangers - jugés par contumace - ont été condamnés à 10 ans de prison. Parmi les neuf accusés détenus, outre les trois journalistes, quatre ont été condamnés à sept ans de prison et deux acquittés. Au total, 16 Egyptiens étaient accusés d’appartenance à une « organisation terroriste » -les Frères musulmans- et d’avoir cherché à « nuire à l’image de l’Egypte » et quatre étrangers d’avoir diffusé « de fausses nouvelles » en vue de soutenir la confrérie. 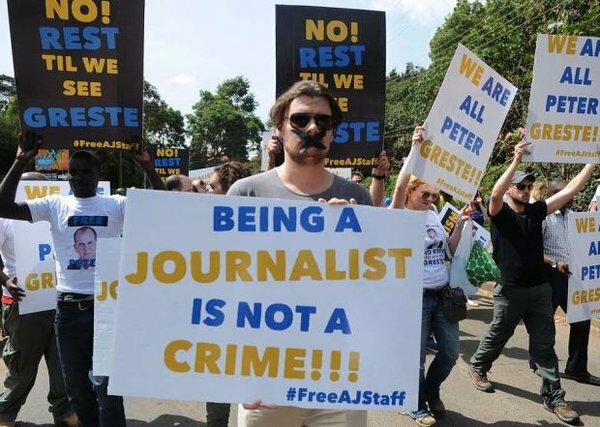 Al Jazeera’s English-language bureau chief Mohamed Fahmy, correspondent Peter Greste, producer Baher Mohamed and cameraman Mohamed Fawzy were arrested ten days ago. Fahmy is of Egyptian origin but holds a Canadian passport, while Greste is Australian. Mohamed and Fawzy are both Egyptian. The Ministry of Interior released a statement identifying the defendants as “elements of the Muslim Brotherhood.” The National Security Apparatus claims to have evidence that the journalists used two hotel rooms to hold meetings with other Brotherhood members, and “broadcast news that harms national security as well as spread false information for Al Jazeera without the approval of relevant authorities,” the ministry claimed. The prosecutor general’s office accused the journalists of terrorism by virtue of their association with the Brotherhood, and harming Egypt’s image abroad through their reporting. The defendants face five years in prison on the charges, since the Cabinet passed a decree designating the recently banned Islamist organization as a terrorist group.